Thank you SO much for the swim lessons this week. My two girls achieved in 3 1/2 days what they could not do in over a year of lessons. This is nothing short of astonishing. Consider Amanda — how she kicked and screamed and howled during the 1st class. Now they can both do it!!! Caroline kept wanting to go back to the swim pool this morning. I didn't know if they could indeed learn to swim independently coming into all this on Monday, but you made it work. So, thank you again for all your love and attention and firmness. And thank you for the instructions today. I will try to keep them up through the year, and hope to see you again next summer. I am so grateful to you for the life-saving skills you've taught Nolan. While I'll always be vigilant when Nolan's in the water, my heart is a little lighter knowing that he's been through your program. As you observed, on the second day Nolan skipped down the driveway to the pool, and he left the lessons so excited about the prospect of swimming again. I saw him experience great joy, and that brought me great joy as well. I am especially indebted to you for taking the time to talk with me before the lessons began because that allowed me to go forward with them. I just wanted to thank you both so much for your incredible talent, patience and knowledge you shared with our family this week! I simply cannot believe all that Charlie was able to accomplish in 3 1/2 days! You all really do change lives! I hope you have a wonderful rest of your summer. We look forward to seeing you again - we are such fans of yours! As a mother I can't thank you enough for all the great work with our kids Jimmy and Katie and I am glad they are water safe now. Thank you for your patience and for making a difference in our lives. Jake and Nick learned so much from you and our family appreciates your excellent teaching and kind personality. We hope to see you again next summer. We are so excited about your lessons  you remain one of the biggest heroes in our son Max' mind and he is so happy to swim with you again! 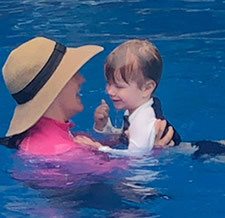 I must tell you though that the whole experience of a few minutes a day of swim lessons with you for seven sessions has been an incredible experience for me as a parent as well. Most of them for the first time  experienced an extremely important skill  how to overcome fear and turn that energy into a force and will to learn, emerging at the end with the pride of mastery (as little as it may be it is there!). Thank you for that! Thank you for your time and consideration! We are very much looking forward seeing you again and to the swim clinic! Thank you so much for working with Isabella. It is amazing to see the progress. Thanks a million. Thank you for giving our Edward the most amazing gift. He has had such fun learning to swim and will remember you for a very long time. What a fantastic man you are. Thank you so much for teaching Rafe how to swim. Rafe is so confident in the pool, he is swimming like a champ. Jay and I feel so much safer now that he is swimming. Rafe asks for "Mr. Ed" all the time and still says you are the boss in the pool. Thank you for the wonderful gift of learning how to "survive." Truly you are a gift from God. Looking forward to next year's classes.